"This food processor includes a unique slicing blade that is adjustable from the outside." "This knife has a soft-grip handle that’s easy to hold, and it’s designed for comfort." "Ideal for chopping veggies, smashing garlic cloves, and even slicing your dinner roast if you don't have a carving knife." "Having a knife like this will help you present your bread in the best possible way." "Has a fat, soft-grip handle that’s comfortable to hold, even when you have a lot of peeling to do." "Good for peeling thin-skinned and delicate fruits and vegetables, like tomatoes, that would be difficult to peel with a standard peeler." "Has five grating/cutting surfaces: coarse, fine, ultra-coarse, ribbon, and shaving." 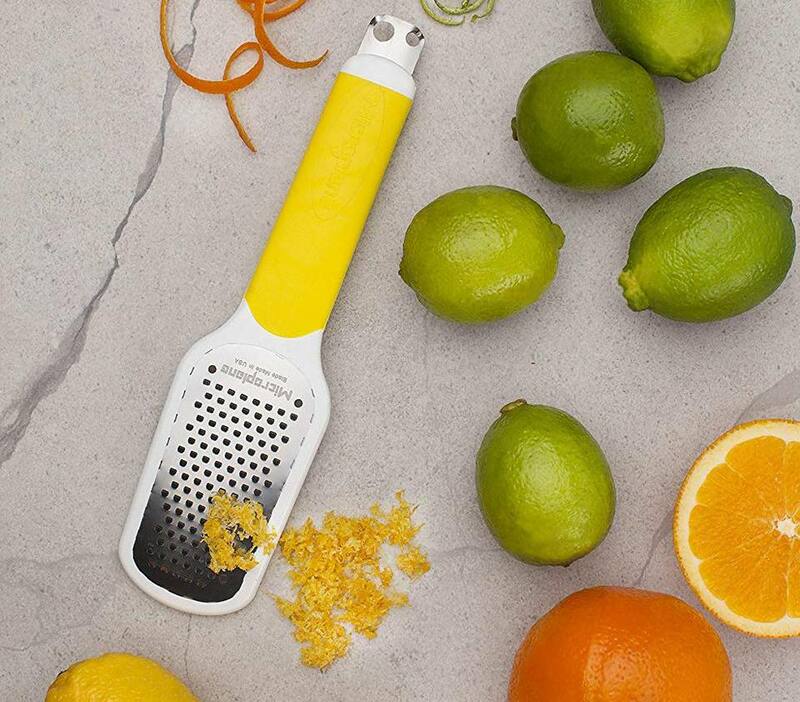 "Has a comfortable handle and a grating surface that’s large enough for easily zesting any citrus from limes to grapefruits." "These shears have food-grade stainless steel blades that are sharp and very precise." "Includes a guard that holds the food and keeps fingers and hands away from the blade for safety." Food processors have become quite common in kitchens these days, and many long-time cooks have owned two or even three different models over the years. The machines have come a long way since the early models that had fewer frills, options, and attachments. This food processor includes a unique slicing blade that is adjustable from the outside, so you can slice your salad radishes thinly, then follow with thicker slices of cucumber without opening the processor. It also has a dicing kit so you can dice vegetables for soups, salads, and stews. For small jobs, it has a 4-cup bowl that fits inside the large bowl. It has both a large and a small feed tube to accommodate larger or small foods, and it includes a shredding disk for making fast work of cheese for your tacos. A storage box is included to store the accessories. 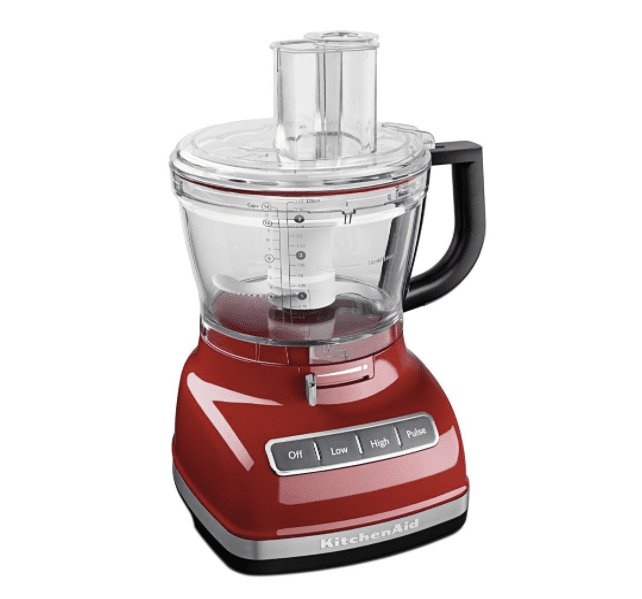 Read more reviews of the best food processors available to purchase online. With their small blades and hand-sized handles, paring knives are designed for peeling and slicing fruits and vegetables, and for other small tasks that require agility and precision, like coring tomatoes and strawberries. Like other OXO products, this knife has a soft-grip handle that’s easy to hold, and it’s designed for comfort. The blade is quite sharp and can be re-sharpened using a home sharpener. This is a relatively inexpensive knife, so you can buy an extra make sure you always have one clean and available to use. A chef's knife is a kitchen must-have, and this version from Victorinox is one of the best. It's made in Switzerland by the company that produces Swiss army knives, and uses a special tempering process that keeps the blade sharper longer, and makes it easy to hone or sharpen when necessary. The ergonomic handle makes it easier for everyone to use, and the 8-inch blade is ideal for chopping veggies, smashing garlic cloves, and even slicing your dinner roast if you don't have a carving knife. A knife just for bread might seem rather specific, but bread is quite different from most things you slice. It has a crust that might be very crisp or very chewy, surrounding a soft, fluffy, squishy interior. The knife has to be able to cut through the crust easily without the user exerting a lot of pressure that would crush the bread, and then it needs to slice through the delicate interior without tearing it. This knife does exactly that, creating beautiful slices of any bread you bake. If all of your bread comes pre-sliced, a bread knife might not be the best use of your money. But if you’re a bread baker, having a knife like this will help you present your bread in the best possible way. This knife is also great for slicing cakes into layers or trimming the cake tops flat. A vegetable peeler is such a simple tool, but if yours doesn’t work well or it doesn’t feel right in your hand, it can make everyday jobs an unpleasant chore. The OXO peeler has a fat, soft-grip handle that’s comfortable to hold, even when you have a lot of peeling to do. The blade swivels easily to perfectly peel fruits and vegetables without gouging too deep into the produce’s flesh which can cause the peeler to stick or skip. The blade is sharp and stays that way through years of use, and it’s dishwasher safe for easy cleaning. Even better, this must-have tool is inexpensive enough to have a spare on-hand for those times when the first one is in the dishwasher. Ceramic peelers are good for peeling thin-skinned and delicate fruits and vegetables, like tomatoes, that would be difficult to peel with a standard peeler. But this ceramic-bladed y-peeler is versatile enough to be used used for any peeling tasks. The y-handle design uses a different hand grip than a standard peeler, which can be easier for different types of produce. The peeler shape you choose largely boils down to personal preference. But the good news is that they are inexpensive enough that you can have both in your kitchen. Box graters have been around for a long time, and they’re still popular—for good reason. You get multiple grating surfaces in one gadget. This one is particularly sturdy and it has rubber feet for stability on the kitchen counter or on a cutting board. It also has small windows on the sides so you can see just how much of your cheese or veggies have been grated, and a removable bottom so you can catch and hold the grated food. It has five grating/cutting surfaces: coarse, fine, ultra-coarse, ribbon, and shaving. A box grater takes a little more storage space than flat graters, but it’s often preferable when grating larges piles of cheese or other foods, and it’s easier to hold than most flat graters. If you like to bake, make cocktails, or whip up your own salad dressings, you probably use a fair amount of citrus zest. And there are several different forms that zest can take: grated, thin strips, or wider strips for garnishes. This combination zester from Microplane does it all. It has a comfortable handle and a grating surface that’s large enough for easily zesting any citrus from limes to grapefruits, and there’s a cover that protects the the grating surface (and your hands) during storage. The garnishing blades are on the end of the handle for easily cutting thin or thick curls of peel. It comes in bright green or yellow color options, which makes it easier to find in your kitchen drawer. Kitchen shears aren’t just scissors that you’ve washed in the dishwasher – they’re made to be good at kitchen tasks. These have food-grade stainless steel blades that are sharp and very precise so you can snip herbs, and they’re engineered to have the torque to cut through chicken bones so you can spatchcock your chicken with ease. The handles are designed to be comfortable to hold, whether you’re left- or right-handed, and the outer portion of the handle is flexible for a customized grip. The scissors are dishwasher safe for easy cleaning. While the blades are fairly short (about 2 inches from the hinge to tip) most scissor-cutting is actually done close to the hinge rather than the tip, so length might not matter. However, these might not be great for times when you want to make long cuts. Mandolines are great when you have a lot of slicing to do, and particularly when it’s important that the slices are perfectly even and all the pieces are the same size. It’s also great for making super-thin slices, like for potato chips, that would be hard to cut by hand. This slicer has two blades for straight cuts. The serrated blade is best for soft foods, like tomatoes, while the non-serrated blade is best for potatoes, onions, and other crisps foods. It also makes julienne cuts and French fry cuts as well as wavy and waffle cuts, so it’s much more versatile than just a slicer. The mandoline includes a guard that holds the food and keeps fingers and hands away from the blade, for safety, and there’s a box for storing extra blades. If you find the guard annoying to use, you can buy a cut-proof glove to protect yourself. But since the blades are so sharp and you’ll be slicing quickly, it’s important to always use something to protect your hands. Read more reviews of the best mandolines available to purchase online.